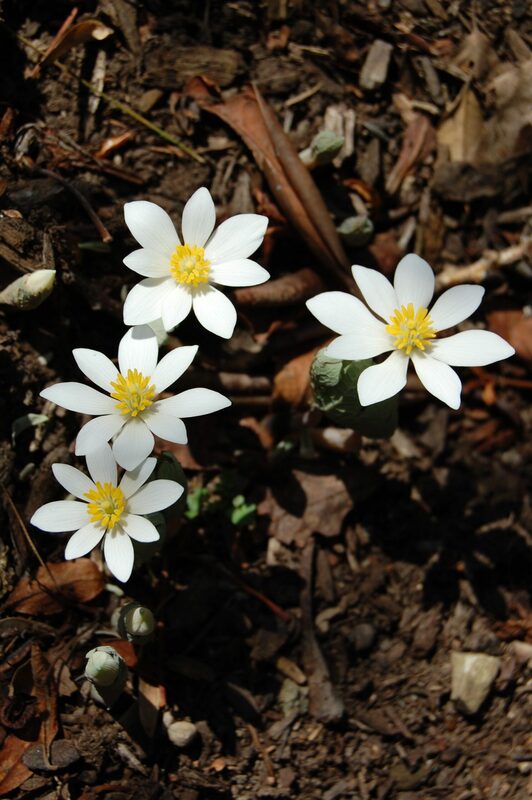 One native plant that can be seen at Goodell Gardens throughout the year is bloodroot (Sanguinaria canadensis). While the flowers are only around for a short while each spring, the unique foliage is apparent during most of the season. The native shrubs and trees in this area were planted in the 1930s by the Goodell sisters. Their design included Pennsylvania’s state tree, the Hemlock, and state flower, Mt. Laurel. Original Mt. Laurel shrubs line the western edge of this area and a dwarf variety, “Little Linda” has been added. Around the cabin you will find other native trees: Sugar Maple, American Hornbeam, and Redbud. Allegheny Chinkapin, a native nut tree, provided the sisters with nuts for roasting. This garden is sponsored by Charlie McDaniel and Catherine (McDaniel) Smith.